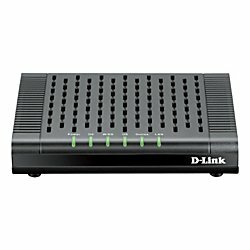 The D-Link DCM-301 is a high-rated modem compatible with most major US cable providers. With DOCSIS 3.0 compatibility and speeds up to 343 Mbps, there is one gigabit Ethernet port and is IPv6 ready. Supporting the use of VPN, the modem also comes with a relatively low price and is wall mountable. In addition to being easy to install, the DCM-301 is a recommended rental replacement for basic internet service plans.